GSK: Glaxo, Study 329 and Keller..
Let me explain a little about Study 329. This was a study done in the 90s to study the efficacy of paroxetine (aka Paxil/Seroxat) in teenagers. The study was conducted by Professor Martin Keller (et al) of Brown University and funded by GlaxoSmithKline (GSK, makers of Paroxetine). The findings that Paroxetine was ‘safe and effective for adolescents’ led to the widespread medicating of children with Paroxetine and other Selective Serotonin ReUptake Inhibitors (SSRIs). What surfaced later was that the study was in fact ghostwritten by a PR company for GSK and that far from being ‘well tolerated’ in children, Paroxetine actually caused children to become suicidal – a matter which was hidden by the drug company. If the SSRI era will stand as one of the most shameful in the history of medicine (David Healy), then Study 329 will as stand the most shameful in the history of Brown University and evidenced based medicine. The integrity of medical professionals and medical journals who publish ghostwritten articles that subsequently causes harm (in this case to children) must also be called into question. According to Shelly Jofre of the BBC, in one year alone, the lead author, Professor Keller, earned half a million dollars from drug companies, including GSK. It’s interesting to note that the journal in question, The Journal of the American Academy of Child and Adolescent Psychiatry, has consistently refused to retract the study. 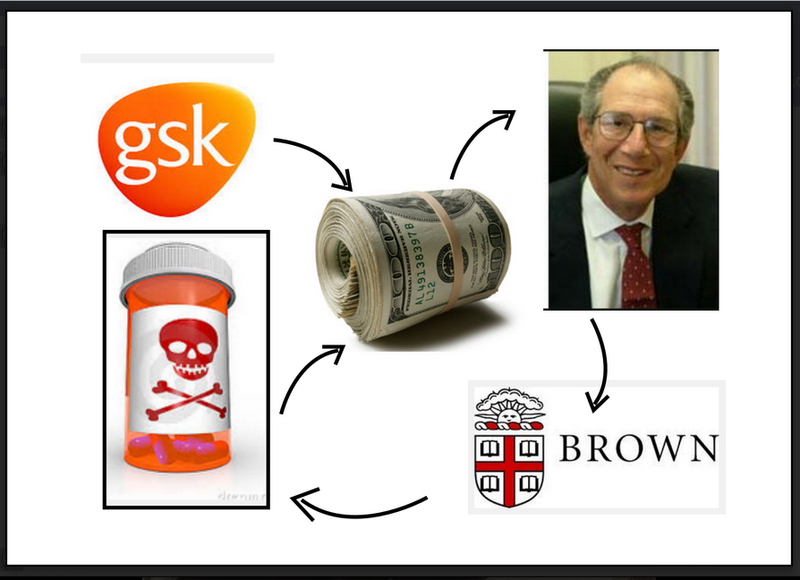 Furthermore, Brown University, despite huge controversy (and huge fines for GSK), has refused to reconsider its position and back a retraction. GSK’s fraudulent marketing of Paroxetine (and other drugs) led to the largest health care fraud settlement in U.S. history – 3 billion dollars. So there you have it – a little background into Study 329. So why bring it up now? Study 329 has been re-written by a team of independent experts, including David Healy and Micky Nardo (aka 1boringoldman) et al. Having spent years trawling through the data of the original study, they have now rewritten its true findings. Yesterday, in what was a momentous occasion for parents who have lost a child to Paroxetine, the British Medical Journal (BMJ) published ‘Restoring Study 329: efficacy and harms of paroxetine and imipramine in treatment of major depression in adolescence’. You will be shocked to note that GSK intentionally hid the hugely increased risk of suicidality in children, subsequently causing many deaths. The re-analysed trial found that Paroxetine “is neither safe nor effective for adolescents with depression”; that at least 12 out of 93 children taking the drug had developed suicidal thoughts (Reuters); with one child being admitted due to severe suicidal and homicidal ideation towards his parents (New York Times). I don’t like using bad language, or to be more truthful, my mother doesn’t like it (I know, I know, I’m feckin 50), yet occasionally nothing else will suffice. GSK, the absolute sociopathic ba**ards, put childrens’ lives at risk, causing many to kill themselves and leaving their parents to endure a pain and grief that no human being should ever have to suffer – for profit. Furthermore, Brown University has actively allowed this situation to continue rather than admit it was wrong. Shame on all concerned. For more information see Restoring Study 329, Davidhealy.org and 1boringoldman. See also GSK‘s mission statement.. ‘to help people to do more, feel better, live longer’. For the sake of my poor mother – no further comment! Previous postThe Hidden Turd: Improving ethics of the Pharma-funded Academic. I also am against the use of bad language but there are very rare times when it is most appropriate and is totally understanable and this is one of the times. Leonie, am currently feeling like my only mission in life is to spill all details of the endurance of intolerable abuse to someone at the forefront of evidence based medicine. I think that fooling myself into believing my value might purely exist as a warning to others could be misinterpreted by a head-doctor as ‘grandiosity’ but in fact, it is the opposite. I search for signs that having survived thus far, there is hope. But believe rather, that I am, have been, and maybe even started out as a fool. Perhaps even Dr. Healy would not be interested in that. I am so sorry for the loss of Shane. I wonder why though, I have found it impossible to encounter another so-called ‘survivor’ of the psychiatric system. Is it that they are all, like me, trying too hard to live against the odds, preferences, and desires of others? There are, for me anyway, different ways of living when you feel inside that you won’t even qualify as a fond memory in the consciousness of a single other human being – is that a living death of sorts? p.s. I wish I too had studied law, instead of being drugged into submission in order to satisfy and maintain the establishment that my upbringing led me to believe in too readily and to my cost. Awh Emer, you are far from a fool. You survived the system and have lived to tell your story. There are many people who would be interested in your experience; the public are just wakening up to this tragedy. It must be hard to believe in yourself after all you have gone through but there are people who can help you to feel the lovely person that you already are. You have my utmost respect for getting this far and it’s never too late to go back and do law, or indeed any other subject that your fancy. Well said Leonie. We both know Cipralex causes suicides also. As Nancy said, other SSRI’s cause the same effects. It’s a drug class problem. They are all just as dangerous and poisonous.